Blood Stone 8mm Large Hole (2.5mm) Round 8"
Bloodstone usually refers to green Jasper with red inclusions of Hematite. 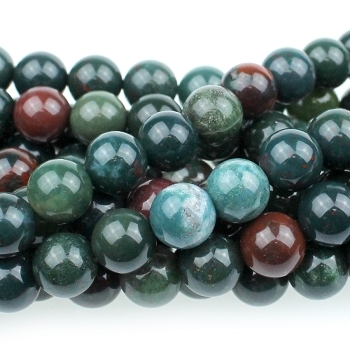 Naturally found in shades of green, blue-green and red, Bloodstone was thought to have both medicinal and magical properties. 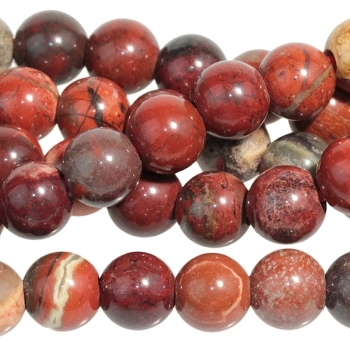 Metaphysically, Bloodstone is said to help energy circulate through both physical, spiritual, and emotional bodies. 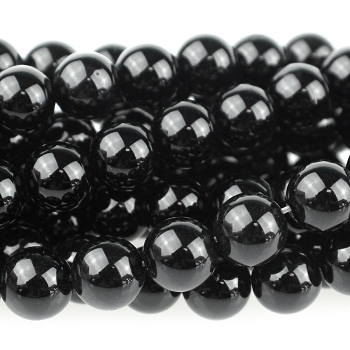 These beads are cut using industrial grade diamond, known as "diamond cut". The sharper facet from this process shows significantly more sparkle than seen in stone cut by other methods. 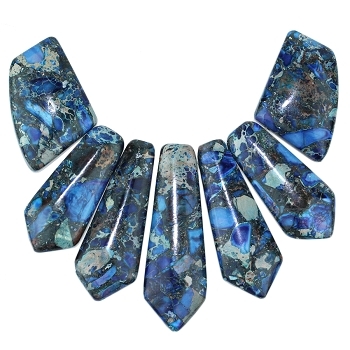 Lapis, a semi-precious stone primarily containing Lazurite, Calcite, and Pyrite, was originally discovered at the Lapis-Lazuli mine in Badakhshan Province in Afghanistan and is currently mined in Afghanistan and the San Gabriel Mountains in California. It is believed to enhance ones insight, intellect, and awareness. 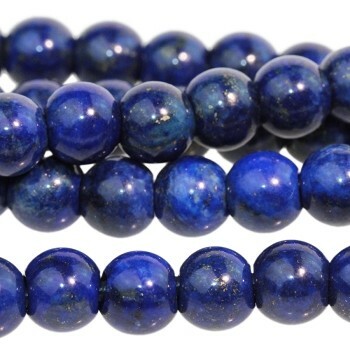 Lapis in the Antelope Beads line of 8" strands has been treated to enhance color. AKA: Lapis Lazuli and Denim Lapis. 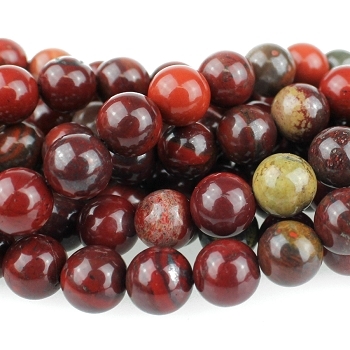 Bloodstone usually refers to green Jasper with red inclusions of Hematite. 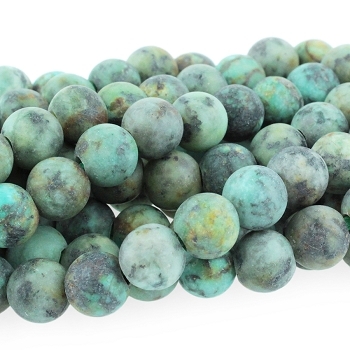 Naturally found in shades of green, blue-green and red, Bloodstone was thought to have both medicinal and magical properties. 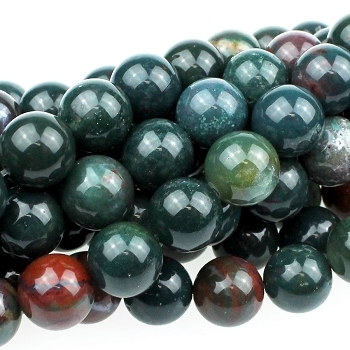 Metaphysically, Bloodstone is said to help energy circulate through both physical, spiritual, and emotional bodies. 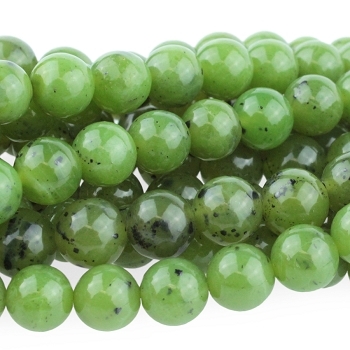 Our Canadian Jade, the industry name for this beautiful deep green stone, is actually a Serpentine. 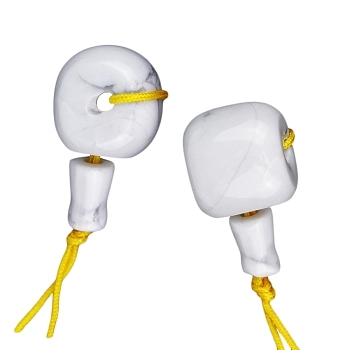 Only a trained eye and a microscope can seen the difference between this stone Jade, its namesake. 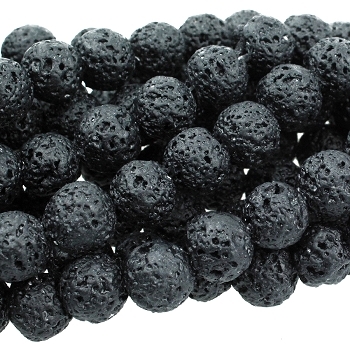 Extremely resistant to fracturing, it has been used to make blades for years. 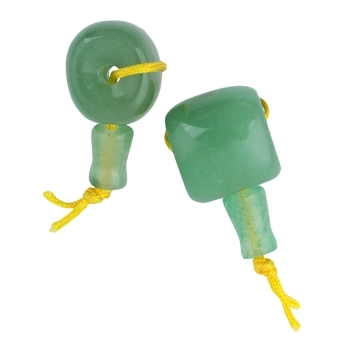 Candadian Jade is believed to bring strength and longevity to those who wear it and protects against failure and misfortune. Lapis, a semi-precious stone primarily containing Lazurite, Calcite, and Pyrite, was originally discovered at the Lapis-Lazuli mine in Badakhshan Province in Afghanistan and is currently mined in Afghanistan and the San Gabriel Mountains in California. It is believed to enhance ones insight, intellect, and awareness. 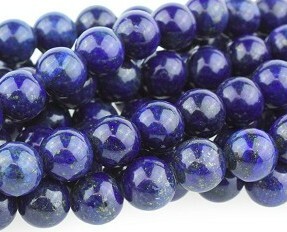 Lapis in the Antelope Beads line of 8" strands has been treated to enhance color. AKA: Lapis Lazuli and Denim Lapis. 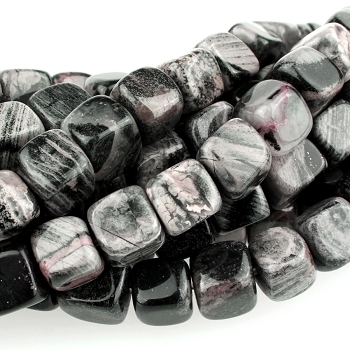 Black Onyx is possibly the most famous variety, but the most common Onyx has colored bands. 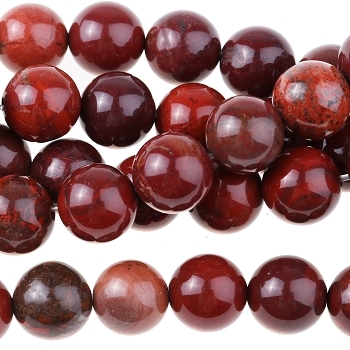 Since ancient times, artificial treatments have been used to obtain the rich black color in Black Onyx and the hues of red and yellow in Sardonyx. 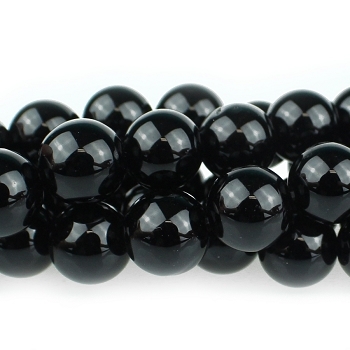 Most Black Onyx on the market have been treated. Mohs hardness 6 - 7. Aventurine is a form of quartz, characterized by its translucency and the presence of platy mineral inclusions that give a shimmering or glistening effect termed aventurescence. 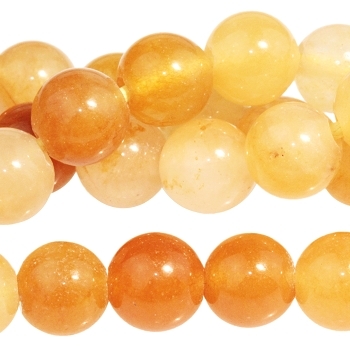 The most common color of aventurine is green, but it may also be orange, brown, yellow, blue, or gray. Chrome-bearing fuchsite (a variety of muscovite mica) is the classic inclusion, and gives a silvery green or blue sheen. Oranges and browns are attributed to hematite or goethite. 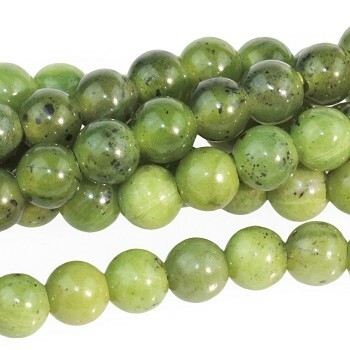 Because aventurine is a rock, its physical properties vary: its specific gravity may lie between 2.64-2.69 and its hardness is somewhat lower than single-crystal quartz at around 6.5. 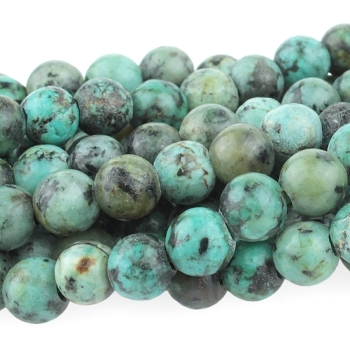 African Turquoise, which is actually a type of spotted teal jasper, is mined in Africa. 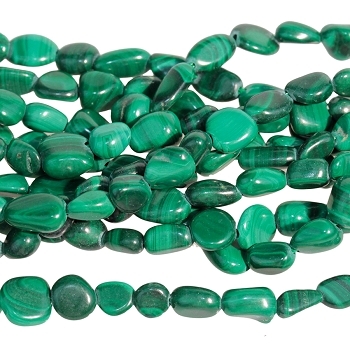 The similarity to the light bluish green of Turquoise is the reason for its industry name. 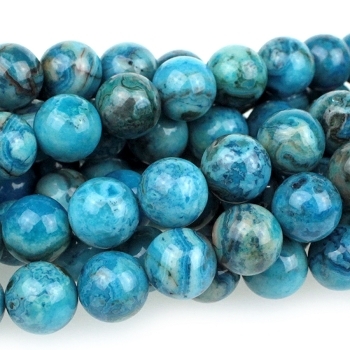 Some believe wearing African Turquoise will attract money. 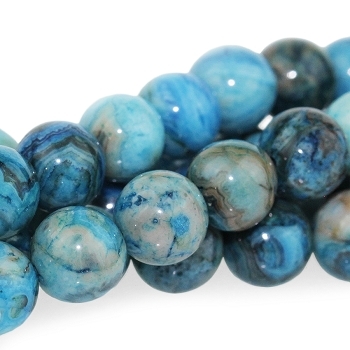 African Turquoise 8mm Round 8"
Blue Crazy Lace Agate is color-enhanced Mexican Crazy Lace Agate, normally white and opaque with swirling patterns. The blue color is added to showcase these beautiful patterns. 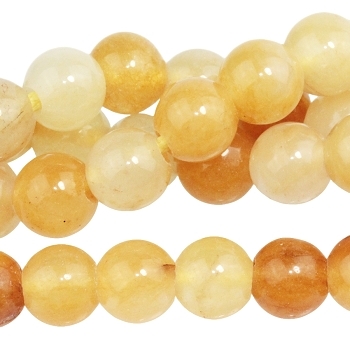 Color enhancing is a common practice with agates to make them relevant in current fashion. 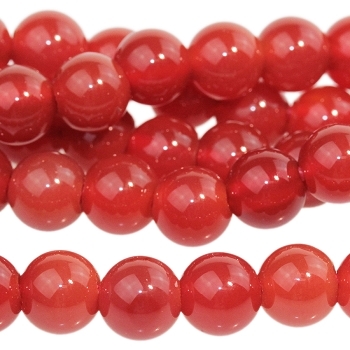 The altered color does not alter the healing properties, believed to keep the wearer balanced and free of fear. Dog Teeth Amethyst, so named for its resemblance to the Dog Tooth Violet, is a mixture of Amethyst and white Quartz, combined together in a striped chevron pattern. It is mined in Africa. 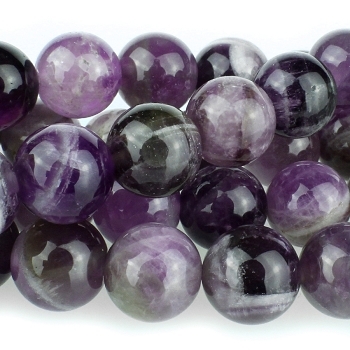 The Dog Tooth Amethyst is believed to help remove resistance to change and to repel negativity. AKA- Dog Tooth, Cape Amethyst, Chevron Amethyst. It is mined in Africa. 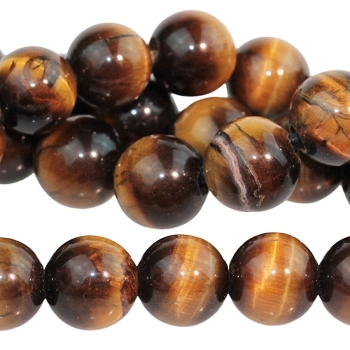 Venus Jasper 10mm Round Large Hole (2.5mm) Bead 8"
Venus Jasper, named for the Roman goddess of beauty, naturally occurs in hues of cream, beige and brown. It is mined in Mexico. 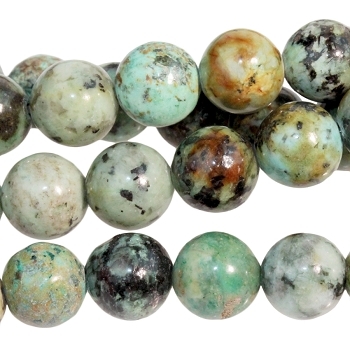 Jasper is most commonly thought to promote grounding. 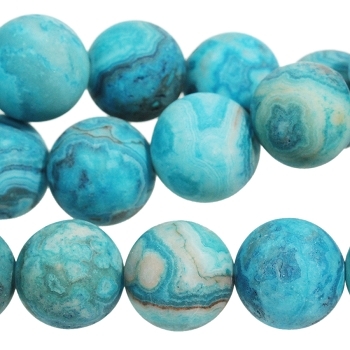 MATTE African Turquoise 8mm Large Hole (2.5mm) Round 8"
Traditionally used in mala prayer beads, Guru beads are designed with three holes, which allows the ends of the stringing material to pass out through the middle of the bead. 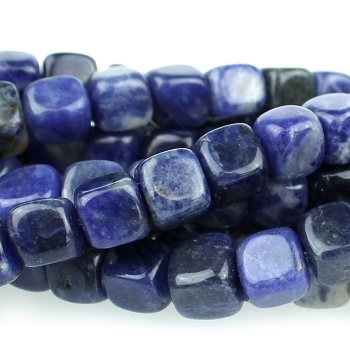 Sodalite is so named for its sodium content. It may be mineralogically classed as a feldspathoid. 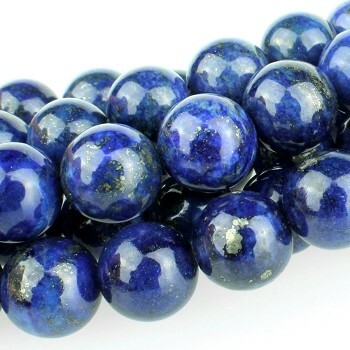 Discovered in Greenland in 1806, Sodalite was not widely used as an ornamental stone until years later when large deposits were discovered in Ontario, Canada. Princess Patricia chose Sodalite to decorate the interior of Marlborough House in England. This beautiful genstone's alternative name is Princess Blue. 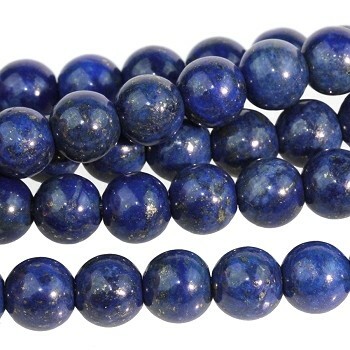 Metaphysically, Sodalite is said to enhance communication. Amazonite, also known as the Amazon stone, is a member of the feldspar family and ranges in color from blue-green to green. 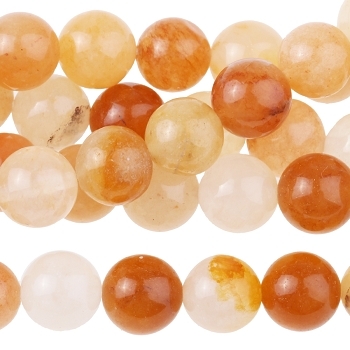 This opaque stone is often found with white, yellow or gray inclusions with a silky luster or silvery sheen. It is mined in Madagascar, Russia and Brazil. 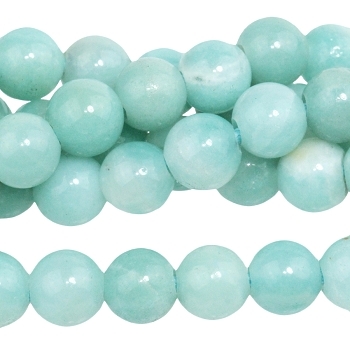 Amazonite is thought to balance energy, harmony and universal love. 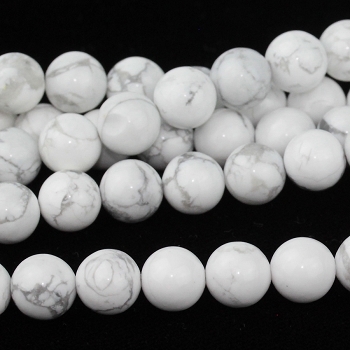 Howlite comes naturally in shades of white and pale gray with dark gray web-like markings. 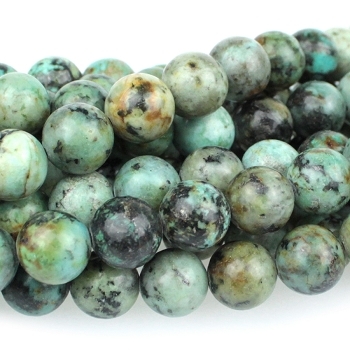 It is easily dyed due to its softness, and is often dyed as a substitute for turquoise. 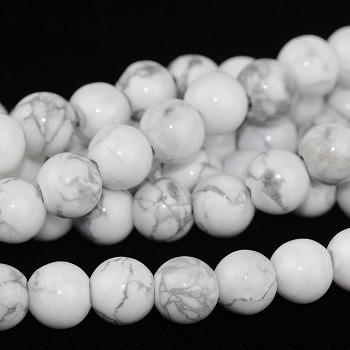 Metaphysically, Howlite is believed to relieve insomnia, ease stress, and increase patience. 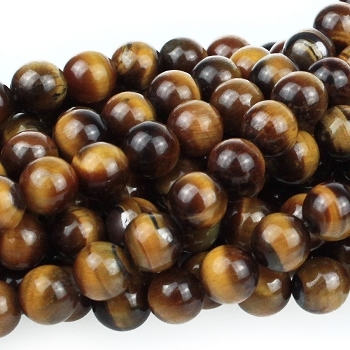 Tiger Eye, a variety of quartz, is chatoyant caused by a parallel intergrowth of quartz crystals and altered amphibole fibers. 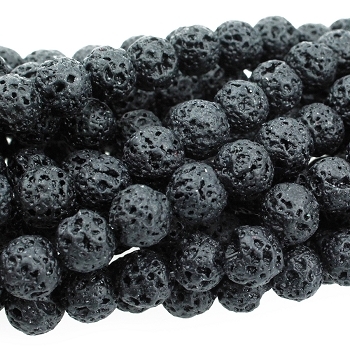 It is believed to enhance wealth and vitality and is mined in North America. 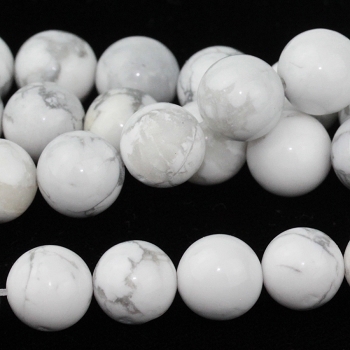 Apple Jasper 8mm Large Hole Round (2.5mm) 8"
Yellow Jade 10mm Large Hole Round (2.5mm) 8"
Yellow Jade 8mm Large Hole Round (2.5mm) 8"
Yellow Jade 8mm Round 8"
Rose Quartz 10mm Large Hole Round 8"
Polychrome jasper was discovered in the deserts of Madascar in 2006. 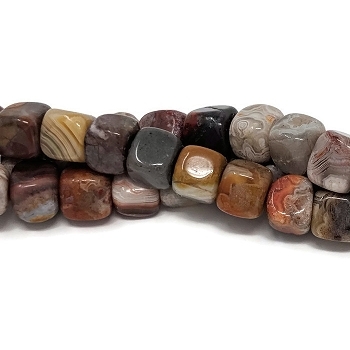 This opaque, multi-colored stone is named for its multiple colors and vibrant shine. It is believed to be one of the rarest chalcedonies on the planet, since it is available only in small deposits. 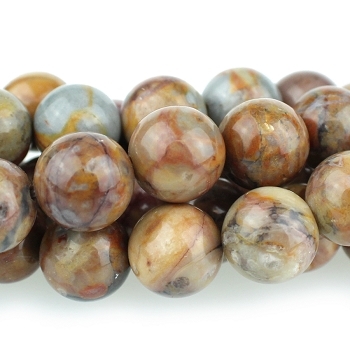 Polychrome Jasper is thought to offer stability, balance and grounding. 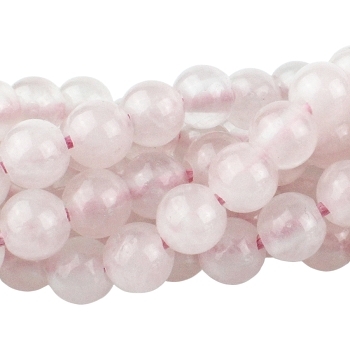 Rose Quartz 8mm Large Hole Round 8"
Composite beads may also be called "mosaic beads" because of the visible fragments. 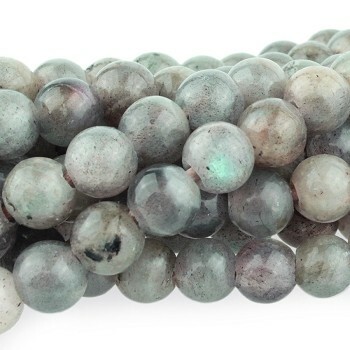 The stone used to create composite beads is usually the remnants from cutting, making them a great way to incorporate upcycled elements in designs. Sodalite is named for its sodium content and may be classified as a feldspathoid. 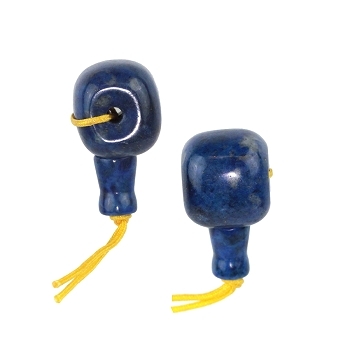 Blue Sodalite is sometimes referred to as “poor man’s lapis” because of its similar color and much lower cost. Mexican Laguna Lace Agate 7mm Cube 8"
Mexican Laguna Lace Agate is one of the most prized agates in the world. 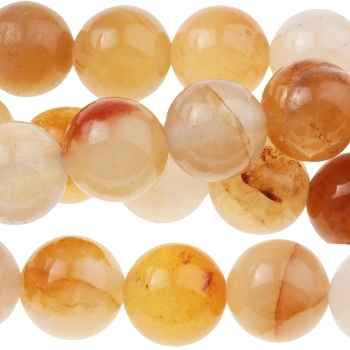 It is a variety of banded Chalcedony with layers that may contain scarlet, deep red, milky white, gray, yellow, gold and brown. It is found only in a four square mile area in a remote mountain range of Chihuahua, Mexico. 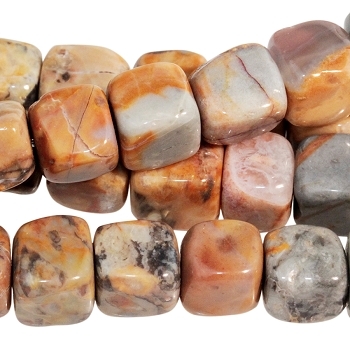 Venus Jasper 7mm Cube 8"
White Moonstone 4-6mm Pebble 15-16"
Moonstone occurs in naturally in shades of white, gray, black, and peach, as well as translucent and iridescent. 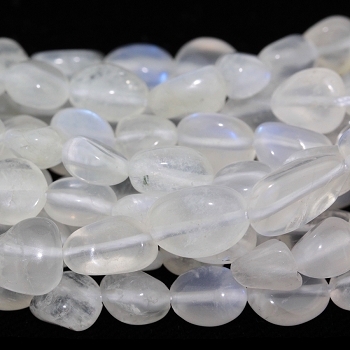 Metaphysically, moonstone is thought to enhance intuition and promote inspiration. 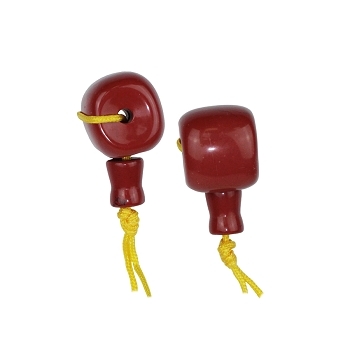 It is also thought to offer special protection to the emotionally sensitive.